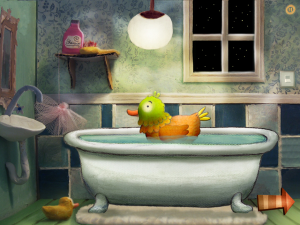 Nighty Night HD Review – Sleepytime Fun! Ease your child into sleep with this interactive bedtime app showing that everyone (and every animal) really does go to sleep at night. The app is specifically designed for parents to use with their young children, so there is no reason to worry about independent play. Ahhh, bed time. You know – that peaceful time at the end of the day when small children drift quietly into a slumber that lasts all night, not to awaken again until the next morning. If you’re nodding in agreement and thinking about how well your children go to bed at night then you must be some sort of magician. My kids fight me tooth-and-nail when it comes to our nighttime ritual. Incidentally, by the time they are in their pajamas I would love to take a nap. Nighty Night HD helps to show children like mine (and most likely yours, yes?) that going to sleep is what all the “cool kids” are doing these days. Muted colors and beautiful visuals from an Oscar-nominatedanimator help to set the scene to keep kiddos from being stimulated, and the British narration voice is quiet and calming. The scene is set as a farm with different animals who haven’t yet gone to sleep as nighttime darkens and the neighbors are getting into bed. Playing is as easy as tapping a light that’s illuminated in various places, such as the dog house or the chicken coop. 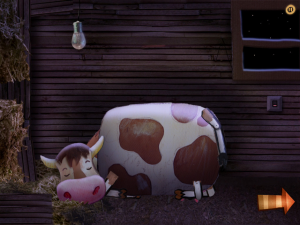 Simply tap the light and it goes out, and the animals on the screen go to sleep. We tried to wake them up by turning on the light again and we were met with a quiet “shhhhh” warning us not to disturb the cozy creatures. Maybe my little ones become spirited at night-night time because they feel like they might be missing out on fun when asleep. Possibly it’s the cookies that were secretly snatched from the pantry before going upstairs to bed. Either way, Nighty Night HD is the perfect addition to the settle-down sessions we have in preparation for sleep. 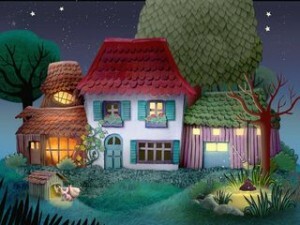 This app is as beautiful as some of our favorite story books and we have made it a part of our rotation. At $2.99 it’s cheaper than a paper book counterpart and well worth it when your child decides that bedtime is the perfect time for showing you how he learned to literally climb a wall. 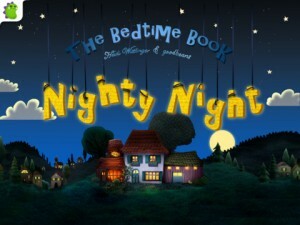 One Response to Nighty Night HD Review – Sleepytime Fun!